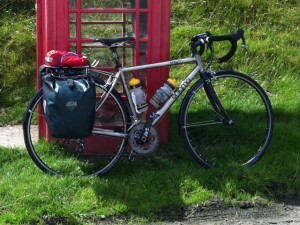 I used the Enigma Etape that I rode in 2012 while touring. A few components had changed since then, primarily the handlebar and stem, which are now carbon, and the water bottle cages, which are now plastic, following the disintegration of the titanium ones during the touring the previous year! I was carrying about 11kg in luggage weight, which gave a total weight of around 20kg.